are reassuring, making life on board that much easier. 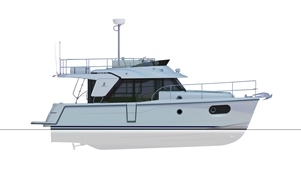 With autonomy of around 200 miles at cruising speed (at 14/15 knots) and large capacity water tanks, the Swift Trawler 30 will take you to places where no other craft of a similar size would dare adventure. 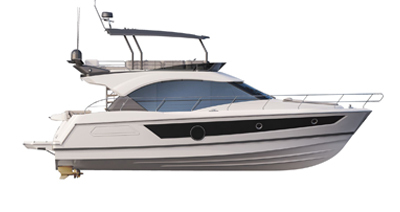 She is a high performance boat and therefore more economical. Full driving station on the flybridge with duplication of all instruments. Single VOLVO D4 300 or D6 370 engine. The transom opens to extend the cockpit space connecting it with the swim platform, creating a real terrace over the sea. The saloon table slides beneath the bench seat to increase the amount of space in this reception area. Fold-away seats slide under the bench seat. These create a U-shaped saloon when unfolded. Driving station with 16" screen, drink holders, etc. Easy access to electronics. King-size bed on jacks: easy access to large storage space, hanging lockers on either side of bed. Second berth in saloon thanks to convertible sofa bed. King-size bed on jacks: easy access to large storage space, hanging lockers on either side of bed. Second cabin with bunk beds. Extra berth in saloon thanks to convertible sofa.